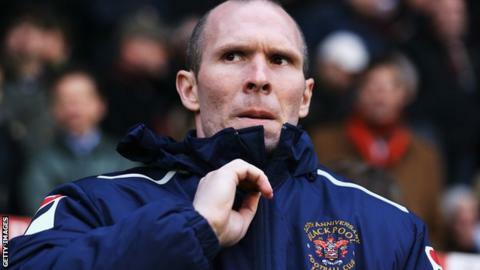 Blackburn Rovers have appointed Michael Appleton as their new manager. Appleton agreed terms on a two-and-a-half year deal on Friday after the Seasiders gave Rovers permission to speak to him. "I am delighted to be joining such an historic club. This is a fantastic opportunity for me and I am excited about the challenge we have ahead of us," said Appleton, who will be joined at Ewood Park by assistant Ashley Westwood. Appleton was appointed shortly before Friday's match at Wolves, which finished 1-1 and lifted Rovers up to 12th in the Championship table. It meant that Rovers won three and drew one under caretaker boss Gary Bowyer since Berg's brief tenure was ended on 27 December. And after Friday's match, Bowyer said: "We're delighted we've got a manager coming in who can provide us with some stability. "He's worked under several good managers and he's a good coach. I know that from when he was in charge of the youth team at West Bromwich Albion. "We're looking forward to working with him. He gave me a call before kick off and wished us all the best. We're all going out scouting tomorrow (Saturday) and we'll meet on Monday morning." Blackpool won two, lost two and drew eight of their 12 matches under Appleton, who replaced Ian Holloway following the Bristolian's departure to Crystal Palace. Steve Thompson, who while Appleton was in discussions with Blackpool chairman Karl Oyston about his future, has taken temporary charge of first-team affairs. Rovers only for their initial approach to be rejected. However, after further discussions between the two Lancashire clubs, to speak to Appleton late on Thursday afternoon. "We are delighted to welcome both Michael and Ashley to the football club. They are both highly regarded within the game and we are confident that they have the drive and ambition to take this club forward," said managing director Derek Shaw..
"We will do everything in our powers to support them in our quest to make an instant return to the Premier League." A tough-tackling midfielder during his playing career, Appleton started at Manchester United, playing twice for the Red Devils in the League Cup before leaving for Preston. He won the Division Two [now League One] title with North End in 2000 and was later part of the West Bromwich Albion squad that won promotion to the Premier League in 2001-02. However, a serious knee injury suffered in a training session mid-way through that promotion campaign resulted in his premature retirement from the game in 2003, at the age of 27. But Pompey's financial troubles dominated his year-long spell at Fratton Park. Appleton was unable to save them from relegation to League One at the end of last season, and with the future of the club in serious jeopardy, his entire first-team squad was forced to leave in the summer. Assistant manager Steve Thompson will take charge of the Seasiders at Charlton on Saturday. Bradford manager Phil Parkinson has turned down the chance to speak to the Bloomfield Road club about replacing Appleton.